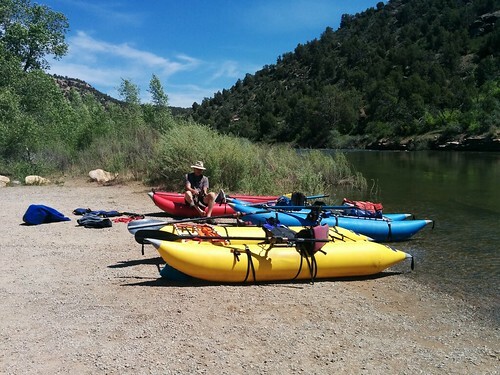 Over Labor Day weekend we rafted the Rio Chama, a wild and scenic river a couple of hours away in New Mexico. We did this trip five years ago (also on Labor Day weekend! ), with a completely different group of people, and once in between then and now. The river is dam controlled with releases on weekends; though sometimes enough water flows during the week to float it, weekend launches are restricted by permit. Fortunately, our friend Jenny got a permit, and (maybe to pay us back for including her on several backpack trips this summer!) invited us along. Not a lot to say about the trip this time, other than it was delightfully non-eventful (where event = raft capsize or camp injury or other thing you really don't want to happen). The only minor disaster happened in our second night's camp, where Ryan misplaced her iPhone and despite ransacking the camp, none of us could find it. We were preparing to leave when she jumped into the water next to her raft and started squelching around with her feet, in case she'd dropped it into the water the previous night without realizing it...and yep, there it was! AND due to its protective case, it still worked! Many of the place names here in the southwest US come from the Jesuit explorers, who tended to the religious in their name choices. For example: the river they named the Dolores, which means Sorrows, as in Our Lady Of. The most sorrowful thing about the modern-day Dolores River is that it's been dammed to create McPhee Reservoir, the water of which goes to irrigate the alfalfa and bean fields of local farmers, and most of the year only a trickle of water flows through the beautiful and remote downstream canyons. 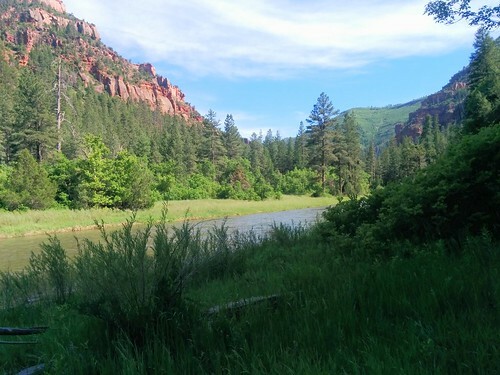 So when the Dolores Water Conservancy District announced that the reservoir was full enough - and the inflow from snowmelt high enough - to do a recreational release for the first time since 2011, local boaters rejoiced. We'd run two sections of the Dolores before: miles 47-97 (Slickrock to Bedrock) twice, most recently in 2008, and mile 141 to the confluence with the Colorado River, the Gateway run, in 2011. When we heard that the river would be boatable beginning the weekend of June 4th, we thought of doing Slickrock to Bedrock again, but we couldn't find anyone willing to join us other than right on the weekend, and we knew it would be crazy crowded then. (You need to have at least two vehicles to shuttle between put-in and take-out, and anyway, it's more fun to boat with friends.) But then on Monday, our friend Joe asked if we'd be interested in a day trip on Tuesday, in the Ponderosa Gorge section (miles 1-19), which we had never done. And so we got to see another part of the Dolores! Ponderosa Gorge is a beautiful canyon, walls of red sandstone contrasting with the dark green of pine and juniper. The grass grows lushly along the banks. No bugs, and few birds, but we did get dive-bombed by a succession of butterflies who must have thought our brightly-colored rafts some new gigantic species of flower before realizing their mistake and flying away, disappointed. We hadn't brought our real camera, and the river was busy enough that I was reluctant to take out my phone-camera while underway, so I only have a few mediocre photos from some places where we stopped on the shore for breaks. The rapids were frequent but not very difficult, and so it was a great deal of fun and not too traumatic - at least, not for us. We did pass a group obviously drying out their gear on shore after one of their number, in an inflatable kayak, bumped a rock and tipped out. We passed a few other groups taking breaks on shore, or camping, as many of them were doing multi-day trips, taking out at Slickrock. But mostly we saw only each other -- and, of course, the butterflies. 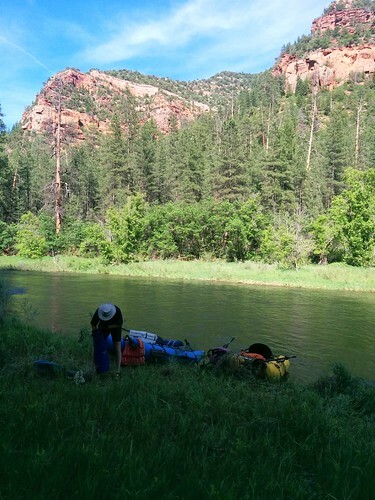 We pulled out at the ramp, disassembled our gear and loaded it onto our truck, shared our last beers, and headed home after a delightful day on the River That Flows Too Infrequently. No sorrows here, just a great day! To my delight, we were invited to join a raft trip on the Grand Canyon! (They want another proficient oarsman, and Britt is that.) To my dismay, it conflicts with the New York Marathon on November 4th, which I have already shelled out quite a lot of money for. After dithering about whether I should try heroic measures to make it back in time to fly to Flagstaff, hire an expensive shuttle service to take me to the Havasu Falls trailhead and backpack down over two days to join the trip for the last week, I decided that three weeks of rafting beats three and a half hours of running, ditched the marathon, and signed up for the raft trip. Anyway, the Grand Canyon, yay! I have rafted it twice with Britt in the 1990s, so it's sort-of-familiar, but it's been a while. I've never run it in the fall season, which is non-motorized rafts only - it will be wonderfully quiet. Also, the trip is longer, because the lower levels of Lake Mead mean that the river below the traditional Diamond Creek take-out has recovered, and we'll be going through stuff neither of us have seen before. Should be fun! We wangled an invite on a Rio Chama trip for Labor Day weekend; the plan was to meet on Saturday, rig our boats, and do the car shuttle, then put in early Sunday which was the first day that no permit is required for the 31-mile section below El Vado dam. As this is a scenic and not too difficult stretch, it's quite popular, and we anticipated a lot of river traffic. Our group comprised eight people on six mostly small boats: Britt and I on our cataraftlets, three duckies (inflatable kayaks), and one large cataraft. We set up all but the big raft on the bank the afternoon before, so in the morning we were more or less ready to go. The Dolores is a lovely desert river in western CO and eastern UT which unfortunately has a very short season due to dam control. Most years, releases are limited to a couple of weeks or less, and of course the river gets very crowded then, particularly on the scenic and moderate Slickrock to Bedrock run (which I've done twice). The lower section from Gateway CO to the confluence with the Colorado River in Utah has a somewhat longer season, as the free-flowing San Miguel river joins the Dolores above Gateway, but usually by mid-June the flows have dropped below what's needed for rafting. This year, however, heavy snow in the mountains near Telluride kept the San Miguel flowing into summer, and conditions looked reasonable -- around 1200 cfs (cubic feet per second), on the low side but fine for smaller rafts -- for a July 4th weekend on the lower Dolores. I would not have chosen this particular section of the Dolores on my own, because among its rapids is an infamously long and difficult one right at the state line between Colorado and Utah which is, oddly enough, called Stateline Rapid. (According to one of our guidebooks it is also called Chicken Raper, although that name seems to be mostly applied by kayakers to the crazy-boaters-with-deathwish line on the left of the big island that splits the rapid, about which our more sedate guidebook says DO NOT GO LEFT WHATEVER YOU DO.) But our previous plans had fallen apart, and I got email from a friend who really wanted to do this section, and Britt thought it sounded good, and so the lower Dolores it was. Or just go straight to the photos (these plus lots more) on Flickr. 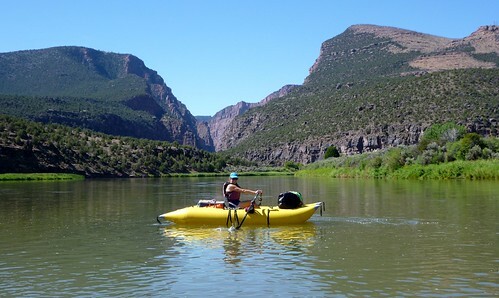 We spent the weekend floating a Class II stretch of the Gunnison between Delta to Whitewater, also called the Dominguez run because the big attraction is Dominguez Canyon about halfway through, where there are historical sites and petroglyphs. We hadn't been on it before, but it's known as a good run for an open canoe, so we invited our canoeist buddies Dave and Julie, as well as our friends Andy and Betsy, who also decided to bring a canoe from their large stable of river craft. The good: Saturday was my birthday, and Julie baked me a cake! Nobody flipped or fell out or even got sunburned. The weather was beautiful. We did not run out of beer, and it was nice and cold. We had a nice camp spot at Dominguez Canyon. 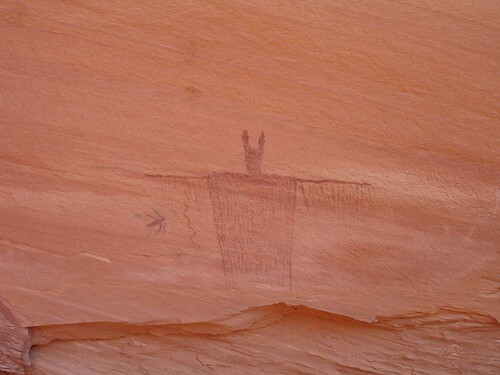 We saw desert bighorn, and petroglyphs, and a couple of really nifty windows in the rock. The bad: Loud group at the put-in that partied all night, and we could hear them from our camp. Loud train that went by twice a night, waking us all. Dogs belonging to loud group peed on our gear (!!) Britt came down with a cold. We got off the river kind of late on Sunday and drove all over the country between Montrose and Ridgway before finding a decent place to camp for the night. The ugly: Nope, not ugly at all. Photographic proof (20 photos at Flickr). 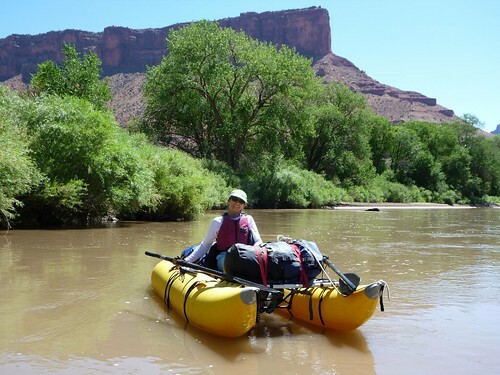 We had so much fun on the San Juan trip from Montezuma Creek to Mexican Hat we did in June that we had to do it again. Britt got on the BLM's website to check cancellations, and found a date on which we could get a permit from Sand Island all the way to Clay Hills Crossing, another ~55 miles past Mexican Hat. These are only a few (I know!) of the 55 photos I uploaded to my Flickr set for this trip. 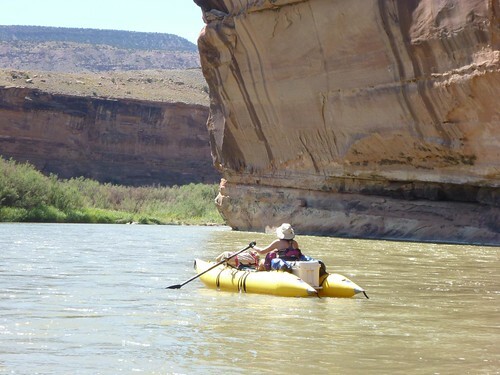 The San Juan, in SE Utah, is the river I did my first river trip on, in 1990 when Britt and I had just started living together. It was also the last river trip that we did in 1998, just before selling our raft along with everything else we owned in order to buy a sailboat and goof off for a couple of years. 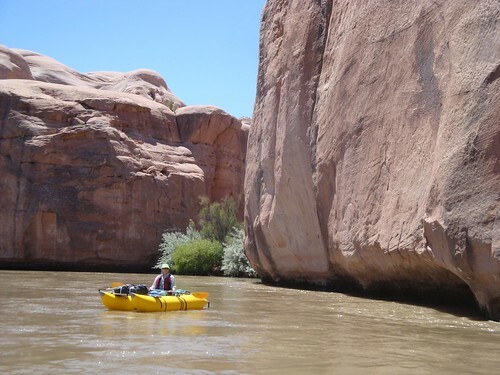 The San Juan funnels all the water from SW Colorado and NW New Mexico through classic Utah sandstone canyons and into the Colorado River at Lake Powell, and was home to both pre-Puebloan native cultures and Mormon settlers. A few years ago, I bought a small paddle cataraft, but I only used it once since Britt didn't have a boat. But when Britt's niece's husband Dublin invited us to come with him and some friends on a San Juan trip, Britt immediately decided he'd better buy one as well. 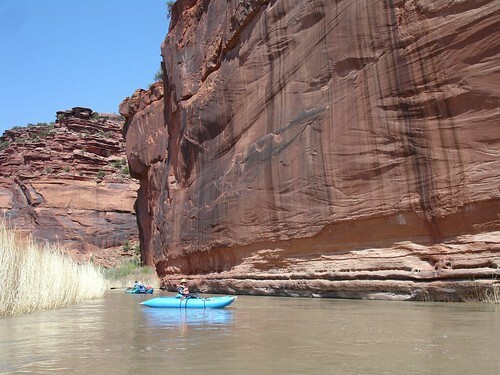 Dublin's friends had only time for a weekend trip, and so they had registered for a permit (the San Juan is lottery-controlled) for only the 28 miles from Sand Island to Mexican Hat. 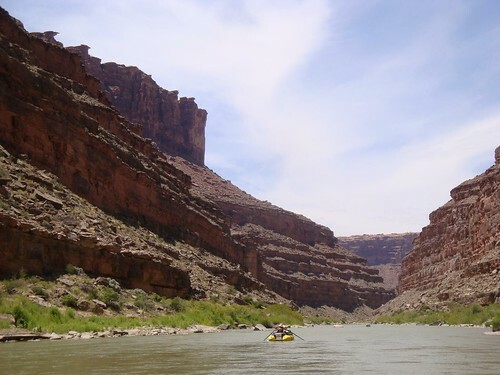 The next stretch of the river, to Clay Hills, goes through the fabled Goosenecks of the San Juan, where the river folds back on itself in big lazy loops, and we would have loved to do that too, but unfortunately there were no available permit slots. Instead we extended our trip by putting in a day and a half early at Montezuma Creek, 19 miles upstream from Sand Island. This rarely-floated stretch (we hadn't done it before) has no rapids and runs mostly through private land, but permits are free from the BLM and easily available. All 18 photos are here in a set on Flickr. Biking: in addition to the Log Chutes ride last Saturday, Britt and I drove out to near Pagosa Springs, about 45 minutes from here, and rode up Devil Mountain, which has a rough and rocky road leading to a cleared summit that used to have a fire lookout tower. Not quite 12 miles up and 3500 vertical feet, woohoo! A few photos are here. Running: I can run again! Sort of! My PT has given me clearance to alternate 5 minutes of slow running with 5 minutes of walking, after a walking warm-up. I did this 3x on Thursday and 4x this morning, and it's not causing the tendinitis to flare up, hooray! It's still going to be a long road to where I was as a runner, though. 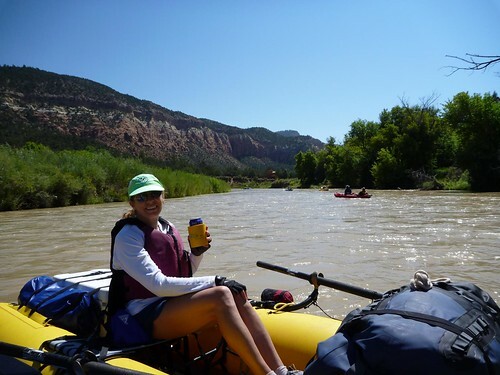 Fun: The newsletter deadline was Thursday noon because Thursday afternoon we drove out to Montezuma Creek, Utah to start a river trip on the San Juan. An exciting and scenic weekend that was not ruined by the roughly fifty bazillion gnats that each took a bite of my tender flesh. More details when I get the photos off the camera. Administrivia: If you have a Dreamwidth journal and a LJ, I preferentially will read you at DW and will subtly filter you out at LJ. I also filter out those I read through another journal. If I read you at DW and you read me at DW you are welcome to defriend me at LJ. I don't do the subscribe-and-filter thing at Dreamwidth since there are separate access and subscription filters, but if the asymmetry bothers you, let me know, and I will cheerfully subscribe to you and then ignore you. Okay, not really, but you know what I mean. And now I am off to a political thingy that didn't get into the newsletter. I will try to be polite to the campaign manager who annoyed me, see above. But Britt was lured away from his work by our friend Jim, who tempted him with fly-fishing from his dory on the Rio Grande near South Fork, so we drove out in our Sportsmobile on Friday night and on Saturday Britt and Jim floated and fished, while I paddled my Fat Cat (which I bought last year after borrowing one to float the Dolores) behind them. Nice and relaxing, and now I really want to get out on the rivers some more. Then on Sunday we drove back as far as Vallecito where we went to a friend's wedding up on his family ranch at the edge of the wilderness, and we drank a lot of very good beer and ate more food than we really should have and took some home with us. Leftover wedding cake = breakfast of champions! The problem with having nice friends who invite you on river trips and loan you nifty inflatable kayak thingies is that then you get all covetous and want to spend money and get your own. 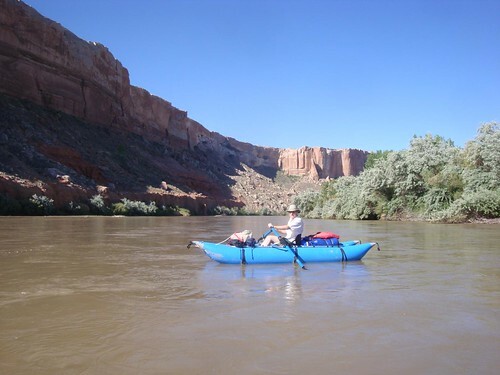 That's me on the Dolores river, paddling the Fat Cat, which is kind of like a cross between a kayak and a cataraft. Steve and his girlfriend Sue are on the cataraft in the background, and Britt, who took the picture, is in an inflatable kayak (duckie). Britt and I traded crafts on and off, but I felt a lot more confident in the Fat Cat and used it in all the named (class II and III) rapids. Part of it was because the cat is more stable and the seat's higher, so I could see better, but part of it was because during my first stint in the duckie, the wind was blowing really hard (well, it was blowing most of the trip!) and one astonishingly strong gust overturned the duckie and knocked me into the water. Yep, I took a spill in flatwater - and had no problem with any of the rapids. Clearly, I have a very special talent. Sigh. I should add that we drove our NEW SPORTSMOBILE YAY out to do this trip (well, it's just a couple hours west of here) and we camped in it the night before we put in - everything seemed to work beautifully. I'm pretty excited about the prospect of more desert trips this spring, and mountain trips this summer. Except now I want a Fat Cat. (Britt wants just a regular inflatable kayak, like the Aire he was using, which costs maybe a couple hundred $ less - not much difference, really.) Steve got his at the Outdoor Retailer show in Salt Lake, which we went to last year and came back from with all sorts of schwag and pro-deal stuff. So the question is, do we shell out the money for the boats now, so we can play all spring and summer, or do we wait until OR in August and maybe save a thousand bucks between the two of us? Thing is, this is a wet year, and there are a lot of tiny rivers which are not normally runnable that we could do. Like the Escalante, which is very tempting - remember this picture from our hike last year? It's runnable maybe one year in five. And this is it. Steve offered to loan us his boats again - but then reconsidered, because he wants to come with us, and he'd need one of them! 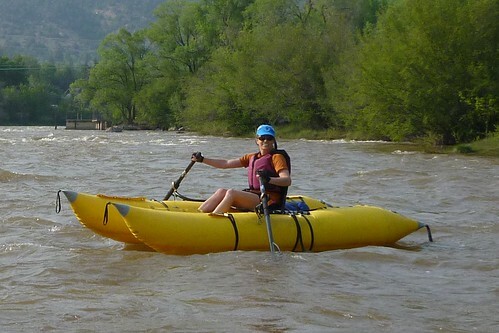 Then again, we could just rent inflatable kayaks, which I'd be fine with as long as we did flatwater rivers. Decisions, decisions.